Importance. - The slug oak sawfly is usually an endemic pest of red and white oaks. From 1974 to 1976, however, it was epidemic in Kentucky, Virginia, and Tennessee. This pest has been reported from Massachusetts through North Carolina, Kentucky, and Tennessee. Repeated defoliations reduce growth, vigor, mast crops, and kill some trees. Identifying the Insect. - Larvae are sluglike, yellowish green, and shiny, with black heads and thoracic legs. They are 1/2 inch (12 mm) long, and feed in groups. The adult is a typical sawfly, about 1/4 inch (6 mm) long and light brown. 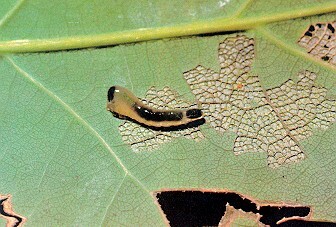 Larva beginning to skeletonize leaf. Identifying the Injury. - Leaves are skeletonized. Larvae consume the lower surfaces of the leaves, making the leaf transparent and revealing a fine network of veins. Defoliation starts in the upper crown in early summer and progresses downward. By late summer, heavily infested trees may be completely defoliated or have a lightreddish appearance. Biology. - Larvae overwinter in cocoons and pupate in the spring. Adults and larvae are present throughout the summer. Eggs are deposited in single rows of slits on the lower leaf surface along main veins. There are two to three generations per year. Control. - Microbial diseases, parasites, and other natural enemies generally keep the slug oak sawfly in check. Insecticides may be needed on high value shade and ornamental trees.